FBN’s Ashley Webster breaks down Chrysler’s October sales data. U.S. automakers reported their strongest October sales in years on Monday, but top-seller General Motors Co missed expectations. Fiat Chrysler Automobiles U.S. October sales rose 22 percent on strong pickup truck and Jeep SUV demand, and beat analysts&apos; expectations. While Ford Motor Co sales fell 2 percent to 188,654 vehicles, the result beat analysts&apos; expectations by nearly 6,000 vehicles, according to a Reuters poll. Ford&apos;s F-Series pickup trucks remained the best-selling models in the United States as it sold more than 63,000 sold in the month, but sales were off 0.6 percent. The miss by Ford was expected because it has lowered production of the F-150 pickup in recent months during the transition to an aluminum-bodied model, which goes on sale later this year. Major automakers in the U.S. market are expected to show a rise of about 6 percent from a year earlier. A poll by Thomson Reuters of 29 economists forecast a seasonally adjusted annualized sales rate of 16.5 million vehicles. "The U.S. economy has steadily improved all year and now we are poised for a stronger expansion backed by an improved job market, higher consumer confidence and lower fuel prices," said Kurt McNeil, GM&apos;s U.S. sales chief. Nissan Motor Co and Honda Motor Co each reported robust sales of their crossover models and record October U.S. sales for their core brands. Nissan beat analysts&apos; expectations but Honda missed estimates. GM sales were 0.2 percent above results from October 2013, at 226,819 vehicles, but missed estimates of analysts by more than 5,000 vehicles. Chrysler&apos;s Ram pickup truck sales rose 33 percent. Sales of GM&apos;s pickup trucks, including the Chevrolet Silverado and the GMC Sierra, gained 16 percent, to 68,530. It was a rare beat by GM&apos;s pickup trucks over Ford&apos;s F-Series. Ford said results were also down because it deliberately reduced sales to rental car agencies by 13 percent. Chrysler&apos;s Jeep brand sales jumped 52 percent. 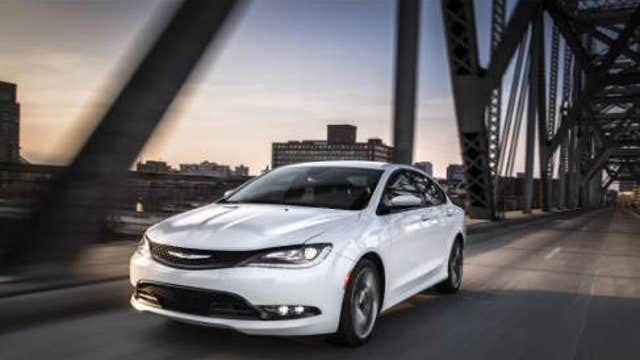 It was the best October for Chrysler sales since 2001. Chrysler&apos;s sales of 170,480 beat expectations by about 4,000 vehicles. GM stock was off 1.3 percent and Ford dipped 0.6 percent. Fiat Chrysler shares trading in New York dropped 2.2 percent but rose 0.8 percent in Milan. Nissan Motor sales rose 13.3 percent to 103,117 vehicles, beating expectations of an 11 percent rise. Nissan brand sales rose 15 percent, while the Infiniti luxury brand&apos;s sales fell 1.2 percent. Sales of the Nissan Rogue crossover increased 14 percent to nearly 14,700 vehicles. Sales of the Sentra small car jumped 56 percent to 13,129. Honda Motor sales rose 5.8 percent, missing expectations of an 8 percent rise.